Summit Medical Center Wound Care and Hyperbaric Center’s Traci Davis, RN and Dr. William G. Morgan III help those with non-healing wounds. An open wound that just won’t heal can be a matter of life and limb. 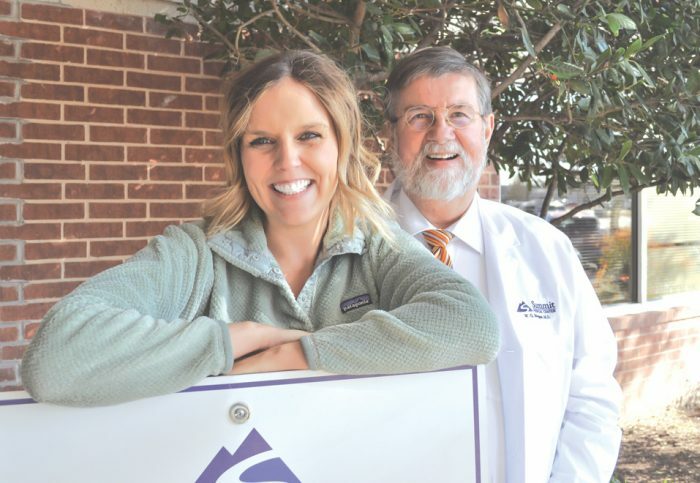 Traci Davis, RN, is the director of wound care and hyperbarics at Summit Wound Care in Edmond and says seniors need to know when to seek care for a problem that can quickly get out of hand. Davis says an open wound that hasn’t gotten at least 50 percent better in four weeks is indicated for advanced wound care. According to the American Podiatric Medical Association, a diabetic foot ulcer is an open sore or wound that occurs in approximately 15 percent of patients with diabetes and is commonly located on the bottom of the foot. Of those who develop a foot ulcer, six percent will be hospitalized due to infection or other ulcer-related complication. Ulcers form due to a combination of factors, such as lack of feeling in the foot, poor circulation, foot deformities, irritation (such as friction or pressure), and trauma, as well as duration of diabetes. Patients who have diabetes for many years can develop neuropathy, a reduced or complete lack of ability to feel pain in the feet due to nerve damage caused by elevated blood glucose levels over time. Often times, wound patients have issues with arterial or venous disease. The holistic approach is one Dr. Morgan adopted long ago. Where some see wounds, Dr. Morgan sees much more. “It’s all connected,” Dr. Morgan explained. “It’s not that we’re treating a wound, we’re treating a person that has a wound. All these things we deal with are connected. And if left unchecked, those wounds can lead to life-altering amputations. “It’s extremely dangerous because diabetic foot ulcers very quickly get infected and can get staph infections very easily,” Davis said. Lower-limb amputations may be rising after decades of decline, according to new data published in Diabetes Care, the journal of the American Diabetes Association. After years of decline, the rate of amputations jumped by 50 percent between 2009 and 2015. Oklahoma ranks No. 8 in the country in the number of individuals living with diabetes. Davis has worked with Summit’s patients for the last eight years. She says it’s like family. Patients are able to self refer to the clinic.